Calling All Purple Squirrels – Our Second Virtual Interest Group is Scheduled For Wed Aug 25th at 1pm. Do you sometimes feel like a “purple squirrel” someone with unique challenges, but struggling to find people with whom you can share those challenges? Well, feel alone no longer — there are others like you, and we’re bringing them to you! If you are a participant, come prepared to chat! 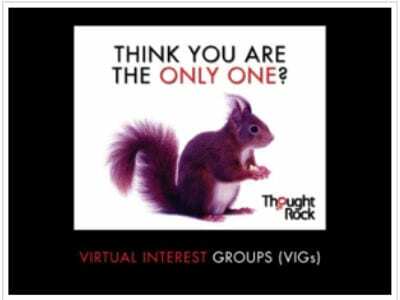 We’ll be meeting in our Virtual Meeting Room, where you and your “purple squirrel” colleagues throughout the global Thought Rock community can share best practices and ideas.